Boomerang: Travels in the New Third World is a non-fiction book by Michael Lewis about macroeconomic consequences of cheap financing available during the 2000s. The book was released on October 3, 2011 by W. W. Norton & Company. The text focuses on the themes discussed in his previous book, The Big Short, and is based on the articles that Lewis wrote for Vanity Fair magazine. In his new book on the seemingly permanent financial crisis, Boomerang: Travels in the New Third World, Lewis shows again why he is the leading journalist of his generation. He writes about important matters — the most important matters — and he writes about them so amusingly that he can permanently change your point of view, even of things you already had a settled opinion about. Who sees baseball the same way after his Moneyball? Football announcers seldom talked about the immense importance of the left tackle before The Blind Side. And, thanks to “Boomerang,” a collection of financial-disaster reports from Iceland, Ireland, Greece, Germany and California, few will be able to think of Germans without recalling what Lewis memorably describes as a national obsession with excrement. In typical Lewis fashion, a bodily aperture becomes a lens for seeing Germany’s role in the global debt calamity. ^ "Boomerang: Travels in the New Third World". goodreads.com. Retrieved 2014-02-26. ^ "Boomerang: Travels in the New Third World Hardcover by Michael Lewis". Amazon.com. Retrieved 2014-02-26. ^ Kakutani, Michiko (September 26, 2011). "Touring the Ruins of the Old Economy". nytimes.com. Retrieved 2014-02-26. ^ Smith, Kyle (2011-09-28). 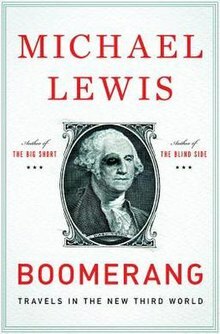 "Book Review: Boomerang, By Michael Lewis". forbes.com. Retrieved 2015-02-28. ^ KAKUTANI, MICHIKO (September 26, 2011). "Touring the Ruins of the Old Economy". nytimes.com. Retrieved 2015-02-28.